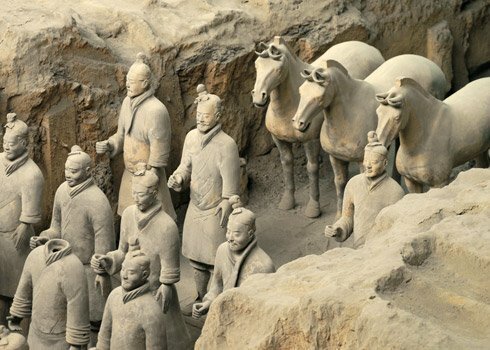 In 1974 some chinese farmers working at establishing a water well at a rural location in Lintong county, Shaanxi province, near Xian, China, stumbled upon an astonishing find in the form of some large-scale terracotta warriors buried in the ground in which they were digging. These few figures proved to be only an "advance guard" of an eventual chinese terracotta army of warriors that has been dated to around 210 B.C. and is believed to have been created by the command of Qin Shi Huang who was the first Emperor of a unified China. The words Shi Huang translate as - First Emperor - so this individual is also known as the first Emperor of the Qin dynasty. The Chinese civilization he led had its roots located in Shaanxi and Henan provinces where the Huang He, or Yellow River, winds its way through its fertile valleys. The Han Chinese settled this area in the 3rd century BC. Xi'an, the capital of Shaanxi Province, lies just a few miles to the west of where the Wei and Huang He converge.